The area of the Municpality of Asopos, south of Molai, offers many picturesque beaches. At Archangelos, Plytra and Karavostasi several lodging houses, meze shops, taverns and night clubs offer visitors a beautiful stay with plenty of delights. Here you can enjoy fresh fish and other sea food, as well as the local traditional desserts (samousada, lychnarakia, diples). In any case the area is reknown for its large production of olive oil, figs, oranges and of exceptional standard or�ganically produced wine. The mesmerizing coastal village of Glyfada, on the borders of the Municipality of Asopos with Elia, is the first one you will come across. The modern town of Asopos follows. Ancient Asopos, member of the Eleutherolakonon Commonwealth, accord�ing to relevant data, was situated at the same loca�tion as modern Plytra. It had its own port and its own currency with the inscription ASOPITON. Papadianika, the head�quarters of the Municipality of Asopos are situated very close to Asopos. Paleokastro, situated in a strategic location and the akropolis of the ancient cities of the area, dominates over Papa�dianika. Relics of the Venetian walls are preserved to this day. A well preserved shady path leads to its peak, which offers a panoramic view of the area. In the last couple of years at Papadianika vari�ous traditions have been revived. The lighting of the fountaras (big fire) every “Tsiknopempti” (Thursday before Lent, relevant to Shrove Tues�day), accompanied by meze, wine, jokes, theatrical performances, dances... The pillorying of Judas� effigy on Thursday before Easter and its burning on Easter Sunday. The Festival of the Fig on the last ten days of August. Northeast of Papadianika in, Finiki, the excavations of 1885 brought to light two temples dedicated to Ask�lipios and Apollonas Iperteleatas. The temple of Appollonas, according to the inscriptions discovered, was the central altar to the Eleutherolakonon Commonwealth. The most important Summer resort of the area is Plytra, a beautiful set�tlement with golden sand. Its port is open to recreation crafts. Important ancient ruins have been traced in all the the seaside area of Plytra. In the sea we can distinguish with the naked eye the remnants of the ancient city of Asopos, which was primarily in its peak during the Hellenistic and Ro�man era and sank during the powerful earthquake of 375 AD. In the area there are re�mains of roman buildings that are also visible, but also an embossed ornament of marble quarry, that depicts Iraklis. Opposite Plytra and be�fore Cape Xyli, the settlement Karavostasi can be seen. In the nearby hill Goula, sections of fortifications from earlier times have been saved. In the area of Bozas there is one splendid beach with rich sand that can be used for swimming. The settlement Paralia Demonas (Pila) is of particular interest, as is the large sandy beach of Charakia which is situated close to Archangelos. 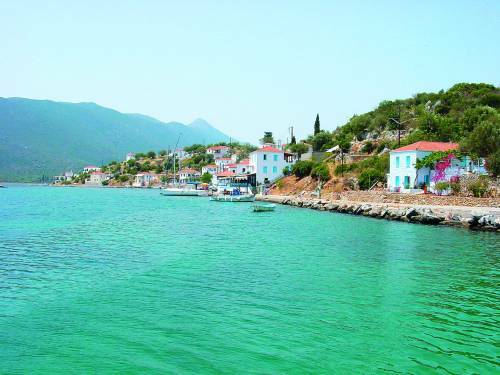 Archangelos is a graphic fishing town with natural beauty, with a clean sandy beach and clear blue waters. It is an ideal location for care-free holidays, swimming, sea sports and fishing, with hotels and taverns, a safe haven for recrea�tion crafts.